Just wanna share my desktop screenshot. I'm gonna edit this post upon request, to post download links, if there are many people interested. Please note that I do not own any of the rainmeter skins I am using, I just modified them for my own preference especially the HWiNFO plugin, which I think is the stable system monitoring plugin for Rainmeter. Yes, thanks for sharing.....that's a lot of info! I want that How do I download it to look just like that? 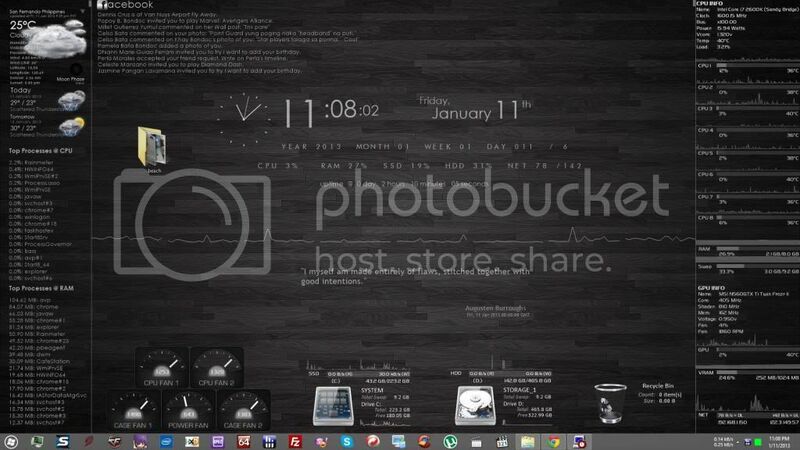 (01-11-2013, 04:19 PM)ney2x Wrote: Just wanna share my desktop screenshot. I'm gonna edit this post upon request, to post download links, if there are many people interested. Wow ! Very nice job ! Possible for you to share ?